The Sony Alpha A6000 Digital Camera with 16-50mm and 55-210mm Lenses builds upon the success of the NEX-6 and offers the performance and creative options of a full sized DSLR in a compact, ergonomic and stylish body. 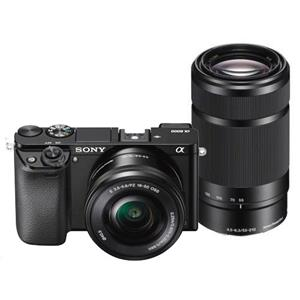 The A6000 in black with Sony E lens mount is built around a new 24.3 megapixel APS-C HD CMOS sensor with Fast Hybrid AF tracking system and a powerful BIONZ X image processor, that together ensure detailed image capture for both stills and movies. Users can enjoy stress-free, intuitive operation as they view scenes through the OLED Tru-Finder (with 100% frame coverage), which features a new optical system with four double aspherical lenses for enhanced visibility, a wide viewing angle, high contrast, high resolution and a clear view from corner to corner. Further to the above, the Alpha A6000 also features a built-in flash, multi-interface shoe, a 3.0” 921k-dot tiltable LCD screen and Wi-Fi and NFC functionality to simplify sharing and connectivity with mobile devices. The Sony E16-50mm f3.5-5.6 OSS Power Zoom lens is perfect for travelling and other scenarios that require a lightweight, compact camera and lens combo. When fully retracted the E16-50mm lens is just 29.9mm, yet covers a wide 16mm to 50mm range (35mm equivalent 24-75mm) for flexible shooting. The lens features one ED (Extra-low Dispersion) and four aspherical elements, resulting in a high-performance lens that is surprisingly portable. The E16-50mm Power Zoom lens with manual override is the first Sony E-mount lens with an electrically driven zoom mechanism. As soon as the camera is turned on, the lens extends and is instantly ready for shooting.